Matfer Bourgeat Nylon Imper Pastry Bag, 13.75'', 10PK 161004 by Matfer Bourgeat at Seasons Cafe Bakery. MPN: 161004. Hurry! Limited time offer. Offer valid only while supplies last. Imper Matfer Pastry Bags. Made of nylon with soldered seams. Extra flexible. Impermeable with adjustable tip. Washable in boiling water. Pack of 10. 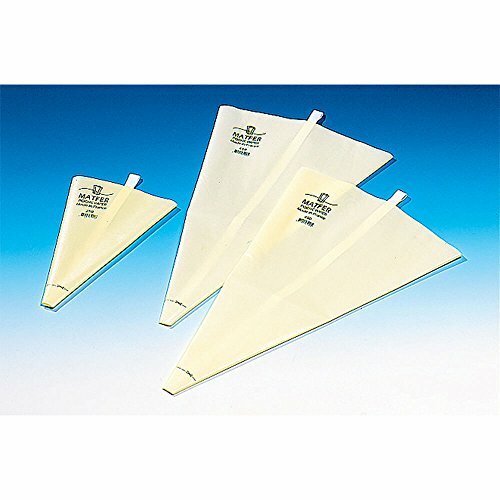 Imper Matfer Pastry Bags. Made of nylon with soldered seams. Extra flexible. Impermeable with adjustable tip. Washable in boiling water. Pack of 10. Measurements: 13 3/4" L. Weight: 1 oz. Extra flexible. Impermeable with adjustable tip. Washable in boiling water. Imper Matfer Pastry Bags. Made of nylon with soldered seams.